We heard on Friday that a piece of space debris would come close to the ISS and that too little data was available to perform evasive manoeuvres. The space debris turned out to be from an old Russian satellite. Its orbit was hard to predict but it would pass by us at a distance of approximately 10 kilometres. That means code red. We had to go to our safe house to wait and see if the debris would hit us. The two Soyuz spaceships function as safe houses and as lifeboats. If something were to hit us with heavy impact, then we would be already safe in our spaceship and we could return to Earth. 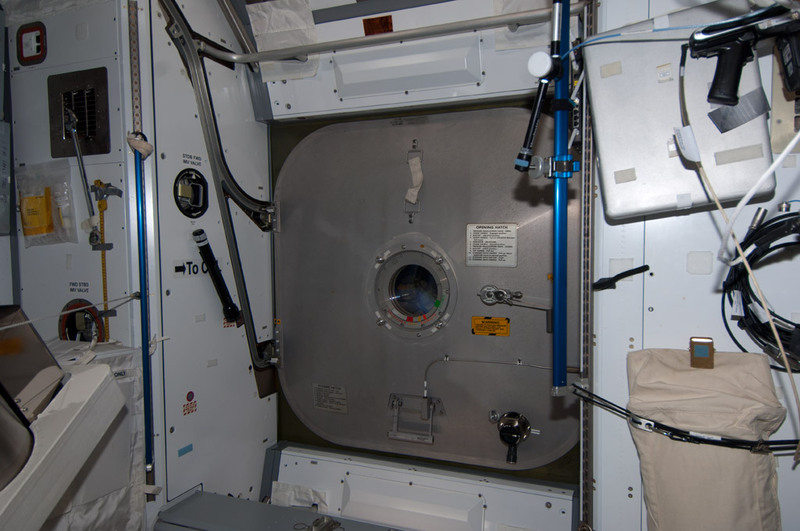 Saturday at four in the morning we were woken and we closed all the hatches in the American part of the ISS. We usually never do this on the ISS, so it was quite an interesting experience in its own right. But this was no exercise, something was really coming! We regrouped in the Russian segment and made contact with ground control to report on the situation. We then took position in our Soyuz from which we continued to converse with ground control. 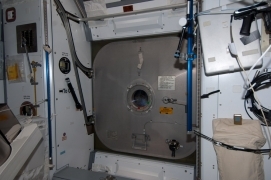 The hatch to the Space Station closed and we waited for a possible impact at precisely 06:38:33. When it became clear that the object had passed we opened all the hatches again. Space debris is a growing problem. Old, uncontrolled or exploded satellites, pieces of spent rockets, small parts and even flecks of paint orbit the Earth at great speed. Some of these pieces orbit the Earth at the same height as we are. These pieces can hit the ISS. Everything larger than 10 centimetres is tracked by radar. There are over 10.000 pieces of space debris in total. The ISS can perform evasive manoeuvres if the orbit of the space debris is known or the crew can prepare, just as we did this time by waiting in our Soyuz. This entry was posted in logboek and tagged debris avoidance manoeuvre, ruimtepuin, Sojoez, veilige haven. Bookmark the permalink. Download de demo van het spelletje “Kerbal Space Program” maar ‘s – daar valt leuk mee te experimenteren! Wat ‘n spannend gebeuren daarboven, groetjes van de aarde.